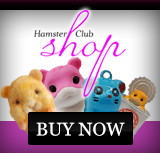 Hamster Club :: Thinking of getting a pet for your little ones? How about a hamster? Thinking of getting a pet for your little ones? How about a hamster? Thinking of getting a pet for your little ones? How about a hamster? They're cute, inexpensive, easy to care for, and a great first pet that will teach your child how to be more responsible. Here are some things I learned during my experience as a hamster owner. I hope they aid you in your pet-purchasing decision. - Hamsters are nocturnal creatures, so expect minimal activity during the day and a fair amount of noise-making from the hamster's cage after hours. Place the cage in a warm, draft-free, secluded spot in the house, where potential activity won't cause a disturbance in the night. Be sure that the lid or door of the cage is securely latched tight, as hamsters are fond of making the occasional midnight escape. As a little girl I awakened many a morning to find my hamster missing, having jimmied the lock on his cage somehow. On several occasions I found him vacationing in a mouse hole behind our kitchen stove and had to coax him out with his water bottle (I'm not kidding about this). It always amazed me that he never injured himself on these wild adventures. - Unlike guinea pigs, hamsters are solitary dwellers. Doubling or tripling up is definitely not a good idea, as hamster roommates will fight and may seriously injure each other. Your hamster will be quite content to live his adult life in his 'single room apartment.' Be sure to provide him with a sturdy cage of either the plastic and metal store-bought variety, or a roomy fish tank with a secure top. Hamster housing essentials: a water bottle that doesn't leak, dry cedar or pine bedding to line the bottom of the cage, an exercise wheel, and a steady supply of hamster food, all of which you can purchase at the pet store. You may also want to buy him a salt lick and a little box of hamster treats. - Once your hamster settles into his new home, the first thing he'll do is build himself a cozy nest. Hamsters are quite funny with their housekeeping ways. You can watch yours fill up his cheek pouches with cedar bedding until he looks just like a blowfish; it's really quite amusing to see. Then he'll run to the corner of the cage and unload the contents of his cheeks. He'll do this over and over until he has a nice, big hill of bedding, and then he'll tuck himself right into the middle and drift off to sleep. He'll likely not want to be disturbed until the sun goes down, upon which you'll see him venture out of his nest, have a nibble of his food and then maybe go for a spin on his hamster wheel. Your hamster will even establish a specific spot in the cage that he uses for a bathroom! - Wet tail is a common hamster ailment that can easily be cured with medicine that you can purchase at the pet store. If your hamster has wet tail, you'll notice his stools will be watery and he may also have a bit of a runny nose, too. 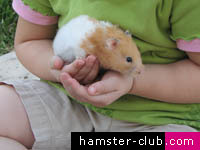 Wet tail is the hamster version of a cold and should be treated promptly, as hamsters are not hearty creatures. To keep your hamster healthy and well, make sure his cage is kept in a warm, draft-free area in the house. Hamsters originate from a warm climate and therefore should not be exposed to a chill. 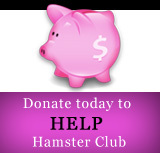 - Your hamster cage should be thoroughly cleaned out at least once a week. It's best to tackle this task outside or near a slop sink in a basement or garage, as it does get messy. Empty all the bedding into the garbage, wipe down any remaining soiled parts, and then use hot, soapy water to wash out the cage. Do not clean your hamster cage with bleach, as a residue can remain that will harm your hamster if he ingests it. - If you've taken your hamster out for a little fun, never leave him unattended on a tabletop or high counter, even for a second. Hamsters do not have depth perception and will no doubt make a sudden dash for the edge of the table. You wouldn't want your hamster to break his leg, would you? On the other hand, he will enjoy a safe romp in his enclosed hamster ball. You can buy one at any pet store. If you or your children aren't ready for the commitment that having a dog brings, try a hamster on for size. Unlike a fish, you can give your hamster a kiss. Unlike a dog or cat, you don't need to feed him every single day or take your hamster outside. He will pretty much enjoy living a quiet hamster life in his hamster house. Sounds like the ideal pet to me!